Sample generator with sub-base fuel tank. Emergency generators must have their fuel source fairly close-by, since engine-driven fuel pumps have a relatively low suction capacity (and are therefore unable to draw fuel from a distant fuel source). To address this need, generators are usually installed with a supporting fuel day tank. 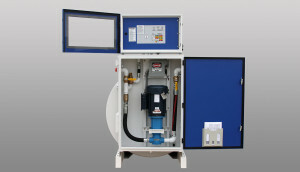 This day tank can be freestanding (separate from the generator set), or integral to the generator’s skid (commonly referred to as sub-base tanks). The sub-base tank approach is a popular choice for many projects for the following reasons. First, a sub-base tank offers the benefits of a compact and integrated package for facilities that will have a single emergency generator installed outdoors within its own weather-protected enclosure. With no separate fuel tank, all fuel accessories and piping are pre-installed by the gen-set packager. Permitting and installations costs are usually lower with this approach. Another reason is that, with the fuel tank located directly under the generator, space requirements are reduced. Sub-base fuel tanks can be sourced in custom designs with storage capacities of several thousand gallons but, to avoid EPA registration requirements, they are often specified to store less than 550 gallons. When a facility requires a longer run-time than is possible with 550 gallons, the designer will usually specify a supplemental tank, installed remotely. This remote fuel tank will be intended to “supply” fuel to the sub-base tank on demand. Adding a remote fuel tank to supplement the sub-base tank has become very popular, but it changes things a bit, since the sub-base tank will now act as a “sub-base day tank”. Serving as a day tank, the generator sub-base tank must now include controls to start and stop a fuel transfer pump (to refill the sub-base tank as needed). This transfer pump must also be sized and placed between the bulk (remote) fuel tank, and the sub-base tank. In some cases, a return pump is also required. A sub-base day tank design is not overly complicated, but I still see it tripping-up engineers and contractors from time to time. A typical design, as described above, will include a bulk tank, a transfer pump, a control panel, and the sub-base tank installed beneath the generator. While the components are simple enough, it is the procurement and coordination of these components that I think causes problems for generator vendors, contractors and engineers. If you review the specifications for a typical project, you will likely find that the supply of these components is split between mechanical and electrical contractors. This is where the trouble begins. I sometimes see the electrical contractor supplying a generator with a sub-base tank, unaware that it must tie into a bulk fuel source provided by a mechanical contractor. Even if fully aware of each other, problems still come up when attempting to coordinate the characteristics of the fuel transfer pump (such as the required flow rate) with the generator’s fuel demand rate. Fuel level controls and wiring are other areas that seem to fall into a gap between the mechanical and electrical contractors. Without a clear specification, the installer will sometimes find that a transfer pump was not furnished, or controls were not included on the sub-base tank, or that the tank is not able to accommodate the required sensors to measure fuel level. Specify a pre-engineered bulk tank and fuel transfer pump system with integral controls, designed and built by a single manufacturer. By pre-engineered, I mean to say that the tank, transfer pump, control panel, and all fuel level sensors are designed and fabricated by one manufacturer. And the entire system is tested as a whole, prior to shipment. Assign the responsibility for the complete fuel system to the electrical contractor, if he/she is also responsible for supplying the engine-generator. The electrical contractor can work with his/her generator vendor to source a complete system that is intended to work with the actual generator that is selected for the project. As the designer, these simple steps will help you ensure that all systems related to the generator are based on, and compatible with the selected generator. When you receive shop drawings for review and approval, you should expect to see a complete system including the generator and all fuel-related components. 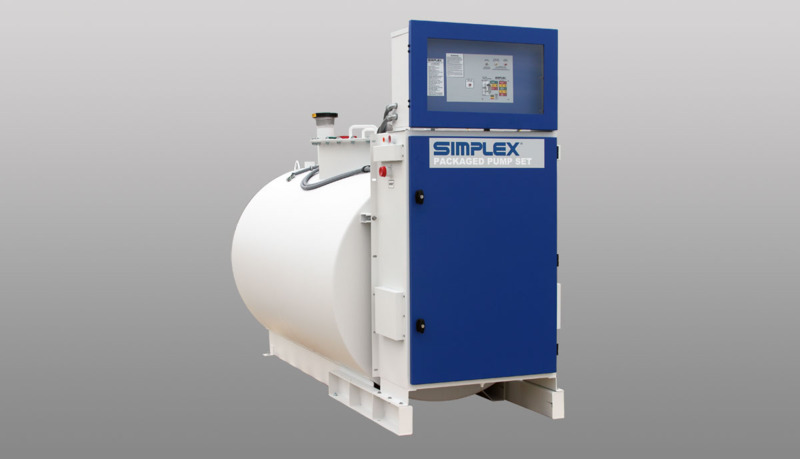 This is an example of a bulk fuel storage tank, pre-packaged with a transfer pump and control panel, all pre-wired and shipped in a single skid. This system was designed to provide fuel, on-demand, to a generator sub-base tank. Once delivered to the job-site, the tank was installed in its concrete pad, and the electrician connected electrical power and the pump’s start/stop signal originating from the level control panel. At the sub-base tank’s location, a fuel level transmitter was installed in the tank, and subsequently wired to a wall-mounted level control panel (also furnished with the package). If you have similar projects, and need help in specifying a fuel system for a generator, call or send us a note. We can support you with product selection and guide specifications, as well as sample drawings to help you complete your project plans. Our review of your project will look for ways to ensure a reliable and cost-effective system, but also one that can be purchased and installed with ease! Have thoughts or comments on this subject? Please share or leave a comment below!